This dramatic weakness in capital formation is worrisome given all the factors that one would expect would generate a flourish in capital expenditures. Central banks have implemented unprecedented monetary stimuli in the form of zero interest rate and quantitative easing, contributing to the dramatic fall in long-term interest rates. 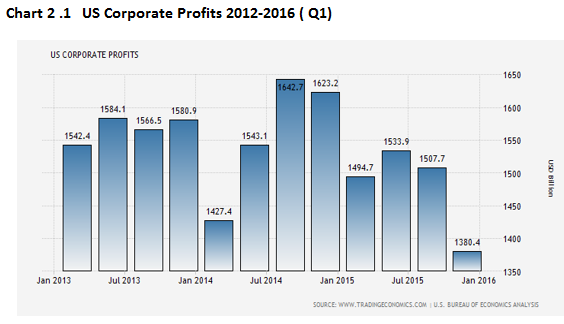 Corporate profit margins are at historic high, and retained earnings continue to grow. And, equity prices remain quite elevated--- all these developments should provide the corporate sector with the enthusiasm to undertake capital investments. Yet, that sector continues to display weakness, contributing to what the IMF characterizes as the`` new mediocre`` growth performance. What lies behind the failure of business investment to expand? The first clue to this answer lies with the slump in corporate profits and corporate profitability. 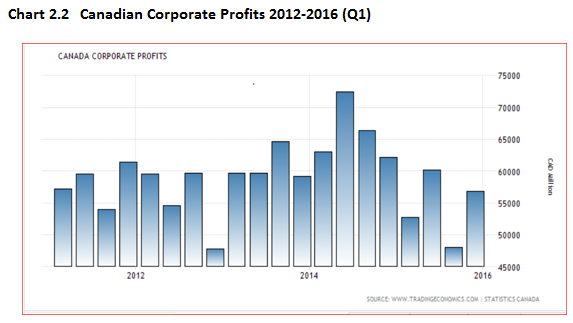 Chart 2.1 and 2.2 shows the significant fall-off in the level of corporate profits in the United States and Canada over the past two years. The principal reason for this decline is the failure for the revenue to grow. Profits would have been even weaker had wage growth not been contained. The Canadian experience exemplifies what lies behind this profit weakness. If we look at the rates of return on equity and on capital employed, we see that there has been a steady decline in returns to investment for all industries and in particular for non-financial industries. (See Chart 3). Whereas the Canadian non-financial companies return on total capital employed registered 6.7 percent in 2104, by the first quarter of 2016 these returns fell a full 100 bps. Clearly, the capital employed was not churning out profits as before, casting doubt on the effectiveness of the investment already in place, let alone what could be expected on new ventures. A recent survey by Statistics Canada on capital spending paints a very disquieting situation. Total spending intentions are expected to fall by 4.4 percent led by a decline of 9.3 percent in the private sector which accounts for about two-thirds of total capital investment. Moreover, expenditures in manufacturing are poised to drop by 11 percent. It is no wonder that the forecasts for the Canadian economy remain tepid. The real engine of growth is badly misfiring. In addition, there is considerable excess capacity in all sectors. 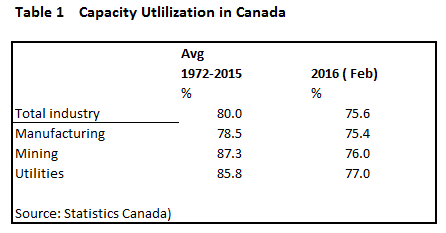 Capacity utilization ratios are currently running at 75 percent compared to the longer-run average of 80 per cent. (See Table 1). 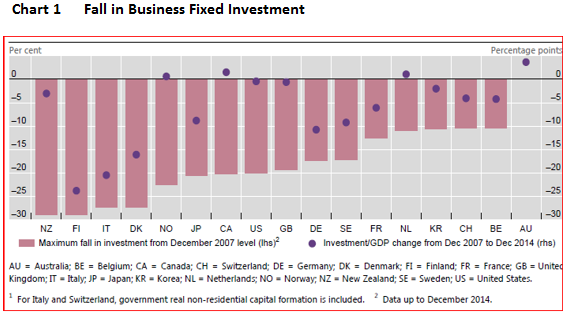 With excess capacity and falling rates of return, Canadian corporations have no real incentive to undertake capital investment.
" the trend in labour productivity influences the outlook for potential output, the current weakness in trend labour productivity reflects the decline in business investment." Thus, we come full circle: the lack of new business investment leads to poor productivity performance which, ultimately, leads to a lowering of the country's potential growth rate. 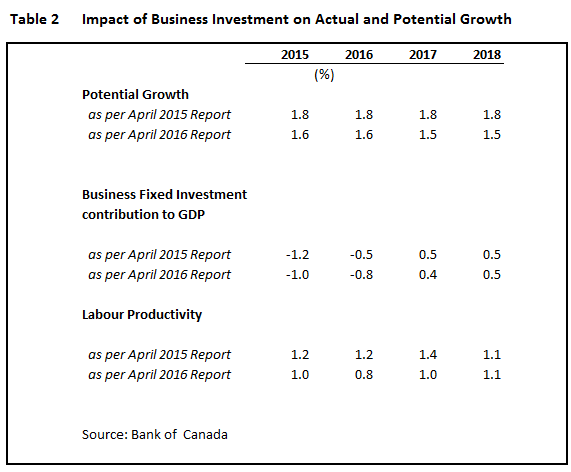 The slowdown in business investment and its implications are now well- embedded in the economy for the next three years at least.